Marks third consecutive year it has raised payout to shareholders. Tractor Supply (NASDAQ:TSCO) has declared a regular quarterly dividend of $0.26 per share, a 30% hike over its previous payout of $0.20 per share. The dividend will be paid on June 4 to shareholders of record as of the close of business on May 20. 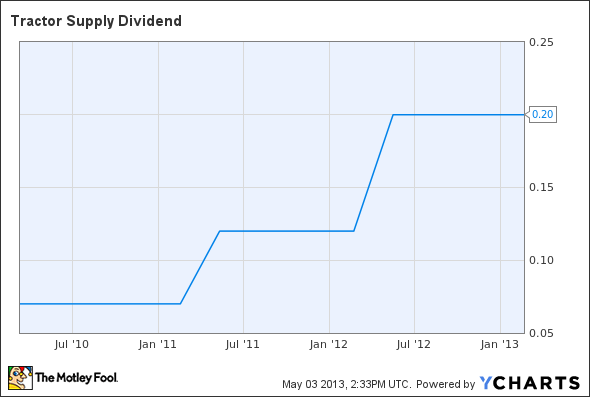 The increase raises the annualized dividend $0.24 per share from $0.80 to $1.04 per share. Noting that the nation's largest retail farm and ranch store chain has increased its payout to shareholders for three consecutive years, Tractor Supply President and CEO Greg Sandfort was quoted in a company press release this week as saying: "Our dividend program, initiated in 2010, is a key component of our balanced capital allocation strategy, combined with capital investments and share repurchases. These programs are designed to drive shareholder value. This 30% dividend increase reflects our board's continued confidence in the Tractor Supply business model and our team's ability to execute the Company's long-term growth strategy." As of March 30, Tractor Supply operated 1,197 stores in 45 states, focused on supplying recreational farmers and ranchers. The new annualized dividend rate will yield 1% based on the closing price of Tractor Supply's stock on May 2. TSCO Dividend data by YCharts.